What's in those invertebrate foods and dusts in your herp room? Commercial products provide (by law) an ingredient list on the label. You know what goes into every homemade recipe you've put together, but do you know the rationale for each ingredient? Which ingredients are beneficial (efficacious), which are harmless and useless, which are helpful but also potentially harmful? Many clinical trials have been published on the efficacy and safety of most (if not all) ingredients you're likely to use. The more you know about the ingredients going into your dietary products, the more informed your decisions will be, and the better job you'll do with chameleons. Before jumping into ingredients, one point is worth noting. When I worked in academics, I occasionally consulted for companies that produced diets and dietary supplements. Many times - indeed, the majority of times - certain ingredients were added in tiny amounts to products intended for all sorts of species, including chameleons. These specific ingredients have public appeal as "good" ingredients but they're also expensive. The quantities added were too low to have a nutritional effect, but were low enough to not hurt the profit margin. Focus groups repeatedly demonstrate that consumers prefer to purchase products with these ingredients included. This muddies our task, because ingredients are listed on labels in decreasing order by quantity, and it is difficult and sometimes impossible to know if the spirulina, for example, listed on a label is added in significant quantities or added just for consumer appeal. I've summarized below clinical data from several ingredients commonly used in invertebrate foods and dusts. If you like this type of information, let us know and send along your requests for information about specific ingredients for future columns. Bee Pollen - Popular as a diet supplement for humans in the 1970s, bee pollen is still found in invertebrate diets and dusts. This ingredient consists of plant pollen, plant nectar, and bee saliva. Plant pollen is the male germ seed from blossoms on flowers, shrubs and trees. Pollen is collected by worker bees, then the pollen, nectar and saliva are worked into granules which are used to feed drone bees. Extensive trials, in test tubes (in vitro) and in animals (in vivo), have failed to find significant benefits from bee pollen. A few in vitro studies with animal tissues have demonstrated protective effects from radiation damage. One study with pregnant rats showed improved maternal and fetal body weights and improved fetal survival when dams were supplemented with bee pollen. The majority of studies, however, show no benefits from supplemental bee pollen. A silver lining to the bee pollen research news is that overdosage has never been reported. Adverse reactions are restricted to individuals allergic or hypersensitive to bee pollen. These reactions can be serious and include liver damage, memory loss, headache and diarrhea. Should we use bee pollen in foods and dusts? Although we don't have data demonstrating benefits in any reptile, I suspect that, of all animals, it would be chameleons that benefit from supplemental bee pollen. I expect that wild chameleons ingest pollen and nectar when taking prey. Because overdosage is unlikely, bee pollen can be supplemented easily. Appropriate dosages for humans range from 1000 to 1500 milligrams daily in divided doses (14-21 micrograms per gram body weight). One caution is to be alert for the odd chameleon that may be allergic or hypersensitive to bee pollen. One sign in humans is prolonged elevation of eosinophils in blood. If your chameleon's blood tests show high levels of eosinophils that cannot be explained otherwise, try removing bee pollen for a few months and re-test blood. Brewer's Yeast - Comprised of single-celled microscopic plants of the Saccharomycetaceae family, yeast microbes covert sugar to carbon dioxide (CO2) and alcohol, hence are used in foods to induce alcoholic fermentation (the fermentation process can be stopped at the point of alcohol production, as in beers, or be allowed to continue to acid production, as in breads). Brewer's yeast contains approximately 7% water, 44% protein, 3% fiber, 7% ash and less than 1% fat. Traditionally, brewer's yeast was used in herpetoculture as a source of B-vitamins and amino acids. Modern nutrition focuses on additional benefits. Brewer's yeast provides (1) selenium (a critical trace mineral that functions as an important antioxidant), (2) beta-glucans which act as immune-modulators, (3) chromium which helps modulate glucose tolerance, and (4) nucleic acids. Brewer's yeast's major drawback is an extremely bitter taste which can markedly lower palatability of invertebrate foods and dusts. When making up recipes, try debittered brewer's yeast for a tastier food. 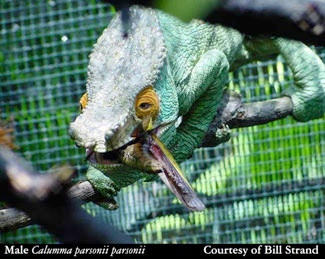 Occasionally, hypersensitivity is found in mammals, but reports of problems are unknown for reptiles, or specifically, chameleons. Because chameleons rely on hydrolytic digestion in the small intestine, excessive brewer's yeast could potentially lead to intestinal upset from fermentation in the large bowel. Generally, brewer's yeast dosages are low enough to be safe. Creatine - This non-protein amino acid is found primarily in animals and thus plays a role in nutrition of carnivores and insectivores. This ingredient is not the metabolite creatinine (note the extra syllable) commonly measured in blood tests. Creatine can be supplied in the diet and it also can be synthesized in the body, originating from the amino acid arginine. Here's where it gets interesting. Arginine is made in the kidney. When the kidney isn't working well, arginine isn't made, hence creatine isn't made. Creatine is part of phosphocreatine, the major energy storage source in the body. Creatine is found in brain, heart, skeletal muscle and other tissues. A sick chameleon that isn't eating and drinking to meet 100% of its fluid needs will shut down parts of the kidneys, effectively stopping the creatine pathway, and depriving the brain, heart and muscles of the tongue and limbs with the energy needed to work properly. I've been very happy with results from feeding trials with enterals (assist-feeding diets) supplemented with creatine fed to sick chameleons. Dosage is tricky, however, because excess amounts will damage kidneys; adequate hydration is a must when supplementing. For this reason, we add creatine (<1%) only to enterals, which are mixed with liberal amounts of water. When provided in this form, it appears that creatine helps maintain muscle strength, tongue function, and brain activity during illness in chameleons. Pure creatine can be purchased in pharmacies; dosages should not exceed 1%. Spirulina - A type of seaweed, this ingredient is a genus in the phylum Cyanobacteria and classified as blue-green algae or blue-green bacteria. The most common spirulina used as food supplements in the US are Spirulina platensis (or Arthrospira platensis) and Spirulina maxima. In vitro studies have demonstrated antiviral action as well as antioxidant and anti-allergic activities, and protective effects in liver. In vivo trials with mammals including humans and poultry are encouraging, although some individuals show marked allergy to spirulina. Heavy metals accumulate in spirulina, especially mercury from contaminated water. If used in chameleons, especially gravid females, use only reputable products that report low or undetectable levels of heavy metals. Don't assume that any brand from any store is safe because it is sold for human consumption. Doses in humans range from 250 mg to 5000 mg daily (about 3-70 micrograms per gram body weight). Concluding - The more you know about ingredients, the better you can use diet to positively affect the health and well-being of chameleons. Would you like more information on ingredients? Let us know; we're happy to oblige.